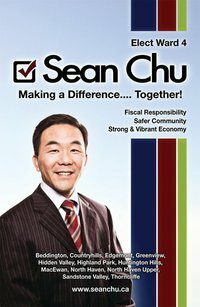 This interview is with Sean Chu, who will be running for Alderman in Ward 4 this term. As noted in a previous post, I know Sean personally and have worked with him on a local board over the past few years. Ward 4 will be a highly contested race and the number of candidates running seems to expand each day! 1) Some of your opponents will make a big issue of the fact that you do not live in the ward. How do you respond to these concerns? SC: I recognize that this would be an issue when I decided to run for Ward 4, but with my roots, and connections all tied to Ward 4, I felt right putting my name forward for the October election. When I came to Calgary decades ago, Ward 4 was my first home. However, now I live in the south in order to be closer to my two daughters, but my extended family, and all my friends still live in Ward 4. It is just not the simple aspect of living, or not living in the Ward that should be the issue that defines an individual’s campaign. The issues that affect Ward 4 are issues that also affect all Calgarians to some degree. The issues that I see in Ward 4: congested traffic on Center Street and McKnight, to the need of more police officers to lower crime, and residents desire to see City Council become more financially responsible, go beyond simply Ward 4. My goal in running for office is to create workable solutions to those challenges for the community that is truly my home. 2) Each Ward has its own unique issues. What do you think is the biggest issue facing the voters of Ward 4 that is totally unique to that part of Calgary? SC: One of the major issues that affect residents in Ward 4 is traffic congestion, because the Ward is one of the oldest in Calgary it lacks the main thoroughfares and LRT that new neighbourhoods in the SW (Deerfoot) and NW (Crowchild) have access to, along with the new ring road, all of which help residents of those communities move faster around the City. Granted, in the West Ward 4 has Shaganappi and John Laurie Blvd to help facilitate traffic, but in the East, with Center Street running down the middle, when rush hour comes it can be a long process to get home. That is why I advocate for City Council to help make Center Street, and McKnight Blvd more efficient in getting residents home faster. Council should look at removing some intersections, and placing walls similar to what we see on Crowchild Trail. Traffic can move faster, and residents along Center Street will have a sound barrier. But we must view this as a long term project, and one that will takes years to accomplish, if the City Council votes in favour, and if its cost is acceptable. There are a few issues that are not entirely unique to Ward 4. When I go door knocking, I hear some recurring concerns that need to be addressed. The most critical to everyone is crime levels in the community, from petty theft, to vandalism. This must stop. In fact, one of my key priorities is to ensure that the Calgary police service receives the necessary funding, so that it is able to function properly in carrying out its day-to-day responsibilities. Residents of Ward 4 should not have to fear for their family’s safety and the protection of their property. I still participate actively in Ward 4, by volunteering extensively in the community. I was also the liaison for most of the Ward 4 communities when I was a director of the Federation of Calgary Communities, as well as when I was a director at the Foundations for the Future Charter Academy; we were responsible for the Greenview Middle school which resides in Ward 4. One of the highlights of my life was when I received the Alberta Centennial Medal for Outstanding Community Involvement because of such volunteering in Ward 4. It is those community connections past and present, that made me decide to run for Ward 4. I hope that when people go to the polls on October 18th that they choose who they want to be their Alderman, based on their policy goals, their community involvement, but also their character. To see real change on City Council we need Alderman who have the passion for the job, but are going in for the right reasons. My passion has always been for Ward 4, and my desire to put my name forward is because of that passion. 3) As a long time member of the Calgary Police Service, can you share some thoughts on what you would do to make Calgary a safer city? SC: Crime levels is one of the chief concerns I hear from residents when I go door knocking, and is a issue that I know can be reduced if the Calgary police service are adequately funded. One of my key priorities is for safer communities. As I have often said, you as Calgarian’s deserve to be free from the fear of crime. Your families should be safe, your property should be protected from theft and vandalism, and the police should never be too far away when you need them. I will advocate for more police on the ground, both on bikes and foot, downtown, and in the more popular areas like 17th Avenue and Kensington, to more car patrols in the outer communities, all so that the police can respond faster. This cannot occur without adequate police funding. But safer communities go beyond the simple funding of the Calgary Police Service. It also involves the proper funding of firefighters, and in pushing the province to review how it manages EMS services in cooperation with the City. This will help improve communication between all first responders. The benefit for every Calgarian is quicker response times for Police and EMS, but will also send a signal to criminals and gangs that the City of Calgary takes crime seriously. 4) In your opinion, what is the biggest mistake that Bob Hawkesworth has made as Alderman? SC: I do not wish to criticize Bob because I know that what he tried to do for Ward 4 he believed was in the best interest of Ward 4 residents. I believe that the residents would rather hear what I can, and will do, to make Ward 4 an even better place for their families to live in, rather than attack someone that has stepped down. Criticism will not solve any of the challenges that face Ward 4. My focus during the campaign will be door knocking, so that I can understand and learn the issues that affect Ward 4 from residents themselves, so I can incorporate them into my priorities. This is how a democracy is supposed to function – issues facing Ward 4 are given a solution from residents themselves. 5) It seems that Snow Removal budget and service seems to be a big issue every winter in this city! Do you have any idea's to help improve the City snow removal program? SC: Snow removal is definitely a huge issue in this election for the simple fact that Calgarian’s are tired of driving on poorly cleaned roads. I understood that there had to be a change to this policy when I was told by a friend a few months ago that she was stuck in a bus on John Laurie Blvd for nearly 10 Hours! And, the woman behind her was luckily driving a camper, and allowed other people who were stuck as well to use her bathroom. This story obviously made me frustrated, especially when the downtown core is scraped clean of snow. The excuse that the City does not have the money for basic snow removal of main thoroughfares is not acceptable, when one considers the basic loss to businesses from their employees not showing up on time, or at all, and the loss to Calgarian’s who get into accidents and have to shell out thousands to fix their vehicles. Waiting for a Chinook is not an option, and Calgarian’s have obviously had enough. That is why I will push for a comprehensive snow policy. A policy that would allow communities to hire private contractors to remove snow, if they want a more thorough cleaning, a process that the City can help facilitate. As well, the City should put more money into snow removal, so that main drags are cleaned often. Finally, the City should invest in more tow trucks in order to keep traffic moving, since we all know that the wait for tow trucks in the winter can be very long. We as Calgarian’s have seen the benefits of the city funding of tow trucks on Deerfoot Trail, such a successful idea should be extended to all main drags in Calgary. If you were elected, what would you do if a motion to sell Enmax came before Council? Would you vote for the motion in order to privatize it or vote against the motion to keep it in city hands? I sent this candidate an email question over 2 weeks ago and received no response. Obviously today at the voting station, I will remember his non-responsiveness and vote for another candidate in my ward who did respond.